Professionals who are effective negotiators are at a much greater advantage when competing for jobs, resources, and salaries. Unfortunately, early career scientists aren’t receiving the negotiation skills training necessary for successful career navigation. Many fall off the research career path as a result, lessening our ability to translate research findings into clinical practice. David Kupfer, MD, a long-time 3C Institute collaborator and professor of psychiatry at the University of Pittsburgh School of Medicine, has spent more than a decade developing effective trainings on career navigation skills for behavioral health investigators. He first partnered with us to create the Career Development Institute for Psychiatry, a training website to extend and expand his successful in-person conference into a longitudinal online training experience with ongoing access to mentoring, peer support, and career development resources. Kupfer then wanted to scale the program to a comprehensive online training course that would reach more people, with an increased focus on the importance of negotiation in career development. With funding from the National Center for Advancing Translational Sciences, we partnered Kupfer and negotiation expert Andrea Schneider, JD, professor and director of the Dispute Resolution Program at Marquette University Law School, to develop Strategy Shaper, a personalized, interactive online course that gives researchers the critical negotiation skills they need to have a successful career. Our partners chose our dynamic e-learning platform so they could personalize the course experience and provide opportunities for hands-on practice and feedback. 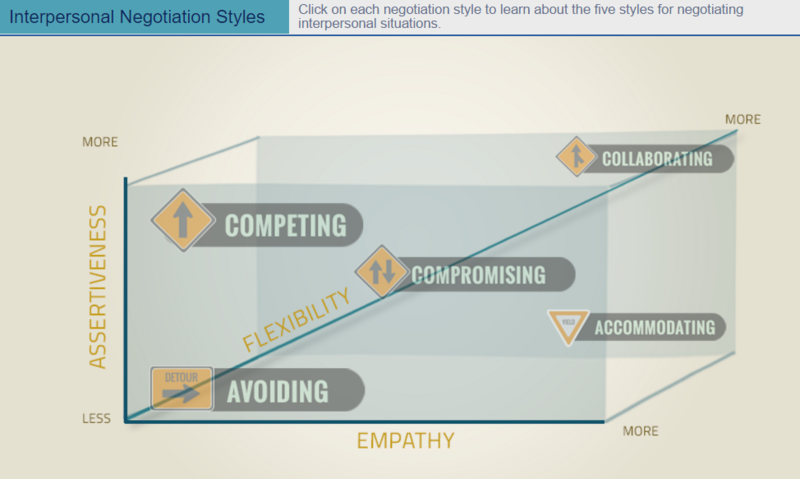 First, users complete the Dynamic Negotiation Approach Diagnostic (DYNAD), a self-assessment that Schneider developed with Jennifer Gerarda Brown, JD, dean of the School of Law at Quinnipiac University, to determine their negotiation style preferences. The course content is then customized based on their results so they can focus on the skills they would most benefit from mastering. 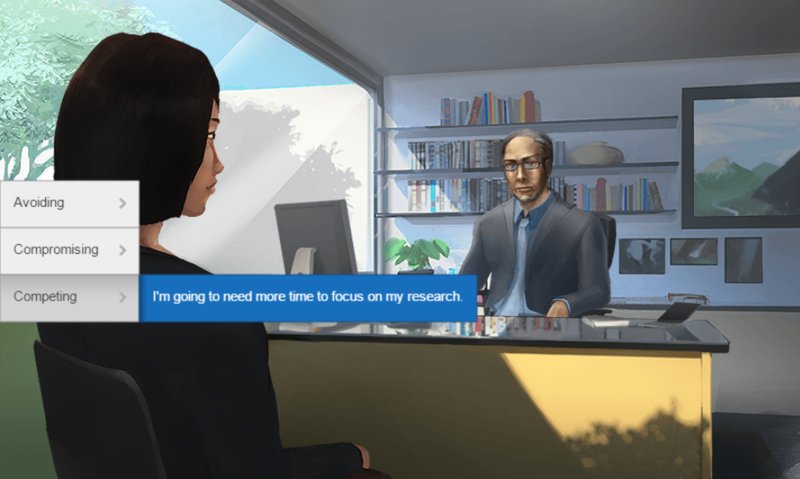 Before trying out what they’ve learned in real life, they can practice in virtual simulations of common career scenarios, such as negotiating authorship or a promotion. Strategy Shaper has received overwhelmingly positive feedback from early career researchers. They not only enjoy taking the course, but also benefit from substantial gains in their career navigation skills. Specifically, course takers show significant increases in their perceptions of their career negotiation skills, occupational self-awareness, and professional self-efficacy as well as greater knowledge of career negotiation skills. Our partners share the program participants’ enthusiasm. “It’s been a superb chance for me to learn new strategies for training and teaching, especially in reaching out to a younger generation of students and young professionals,” says Kupfer. Kupfer and Schneider credit 3C Institute’s focus on collaboration, background in behavioral health, and positive group dynamic for creating a thriving, successful partnership. They also say they’ve been able to explore new areas of research as a direct result of our work together. We are grateful to our partners for referring our services to their colleagues. Strategy Shaper is now available for purchase. David Kupfer and Andrea Schneider are coauthoring a book on negotiation skills for professional development to complement the course. *Kupfer, D. J., Schatzberg, A. F., Dunn, L. O., Schneider, A. K., Moore, T. L., & DeRosier, M. (2015). Career Development Institute with Enhanced Mentoring: A Revisit. Academic Psychiatry. Advance online publication.